If you compare 10 similar healthcare organizations, chances are, you’ll find their websites and social media channels all say the same thing. They’re the most innovative, the highest quality this and that… you know the drill. These kinds of statements used to work, but today’s consumer (patient) is far savvier now than in recent years, and they tend to dig deeper to learn as much as they can about an organization before deciding where to seek treatment or what doctor to see. To cut through the generic messaging being projected by many healthcare organizations, patients are looking to reputation and word of mouth for true insight into quality, safety, and other factors critical to their healthcare experience. In fact, a study by the National Research Corporation showed that 9 out of 10 people considered reputation when making a choice for their healthcare. Fortunately, for both high and low performing organizations, there are ways to boost reputation and legitimately position your organization positively in the minds of patients. According to the same study by the National Research Corporation, there is a direct correlation between patient experience and reputation. In fact, the study showed that facilities that scored low on patient experience also suffered in reputation scores. 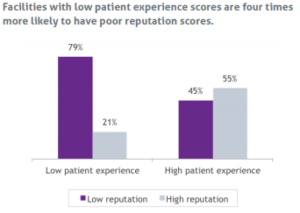 On average, reputation scores were four times lower for organizations with low patient experience. To ensure that poor patient experience isn’t impacting your online reputation, it’s critical that your organization regularly seeks feedback from patients. Any feedback received should be analyzed, and any areas where scores are on the lower end should be addressed. A third-party patient experience assessment tool should be used to determine where your organization stands regarding providing a high-quality experience to your patients. Any non-third-party, homegrown solution could lead to biased responses, thus not offering true insights. While enhancing the patient experience can help boost your reputation going forward, what about those negative reviews that already exist online? You can learn a lot about how patients view your organization by scouring sites like HealthGrades.com, Vitals.com, and even more generic sites like Yelp or Yellow Pages. Paying attention to what your patients and others are saying about your organization on social media sites, like Facebook for example, can also provide you with some deep insights into your online reputation and how you can improve it. By assessing comments about your organization, you can pinpoint additional opportunities for change and highlight problem areas that can be addressed. If you decide to take the extra step and get involved in the conversation, make sure you are doing so in a HIPAA-compliant manner. Again, this one comes with the caveat of doing so in a HIPAA-compliant manner, but it’s something from which all healthcare organizations can benefit. By actively posting on social media, you provide an additional layer of communication and transparency with your patients. Social media allows you to connect in a more personable way with your patients. It allows you to provide important (HIPAA-compliant) information and stay in touch more easily. In a sense, it makes your organization human, which makes it easier for patients to connect and encourages them to remain loyal. It’s easy to fall into the trap of thinking that your patients love you, and your organization is at the top of its game. And there’s always the chance (hopefully a good chance) that following these tips will lead you to that conclusion. That said, most organizations across most (or all) industries could benefit from some level of improvement, some more than others. In today’s healthcare environment, staying on top of your online reputation can help you not only pinpoint necessary improvements, but can lead to increased patient loyalty and the ability to generate new revenue through new patients choosing your information, simply because your online presence is better than the competition.